This guide contains information about areas surrounding Eglin AFB, Hurlburt Field, and Duke Field. You will find detailed information about each city surrounding each base including neighborhood information about Crestview, Navarre, Niceville, Valapariso, Shalimar, Fort Watlon Beach, and Destin. Download this guide and begin your PCS research! Eglin Air Force Base is located in northwest Florida, comprising over 640 square miles. Eglin Air Force Base is located 3 miles southwest of Valparaiso, Florida in Okaloosa County. Eglin is an Air Force Materiel Command (AFMC) base serving as the focal point for all Air Force armaments. Eglin is responsible for the development, acquisition, testing, deployment and sustainment of all air-delivered non-nuclear weapons. Hurlburt Field is an installation located in Okaloosa County, Florida, west of the Town of Mary Esther. It is part of the greater Eglin Air Force Base reservation, and is home to Headquarters Air Force Special Operations Command (AFSOC), the 1st Special Operations Wing (1 SOW), the USAF Special Operations School (USAFSOS) and the Air Combat Command's (ACC) 505th Command and Control Wing. Duke Field is a military airport located three miles south of the central business district of Crestview, in Okaloosa County, Florida. 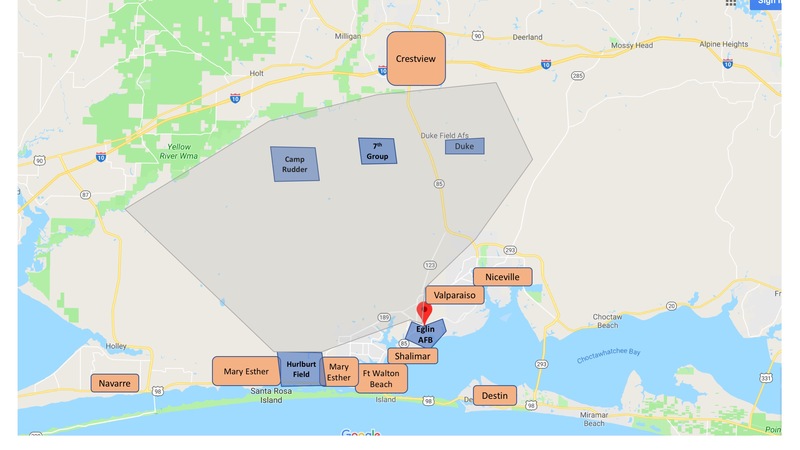 Duke Field is known as Eglin AFB Auxiliary Field #3, Although technically part of the larger nearby Eglin Air Force Base complex, today Duke Field is essentially a small air force base in its own right. The 7th Special Forces Group is an operational unit of the United States Army Special Forces activated on 20 May 1960. In 2011, 7th SFG(A) relocated from Fort Bragg, NC, to Eglin AFB, Florida, as part of the 2005 Base Realignment and Closure (BRAC) round. Camp James E. Rudder is host to the third and final phase of a nine-week training course, dubbed the "swamp phase", of the U.S. Army Ranger School. Navarre is located halfway between Destin and Pensacola surrounded by gorgeous beaches. 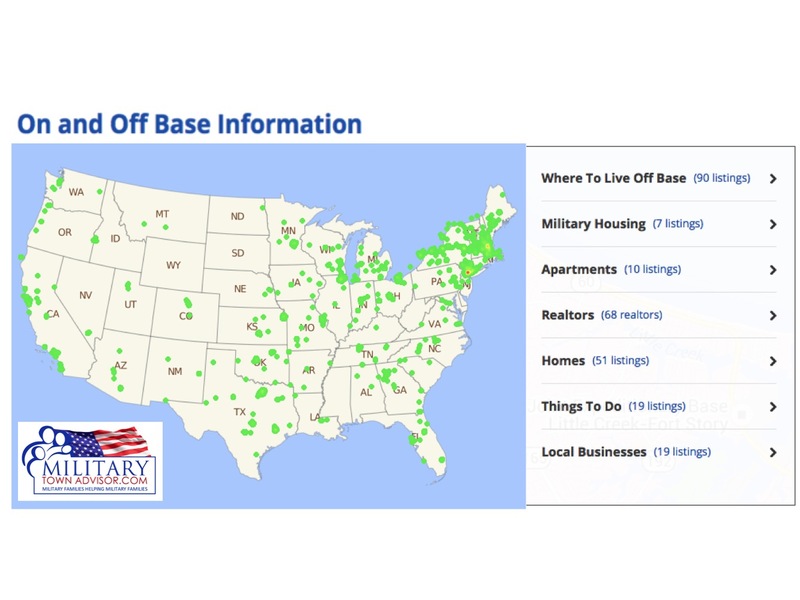 With Eglin AFB and Hurlburt Field being the closest bases, this area is full of military families. Navarre is a quiet, family-friendly area and a typical calm beach town. People in the area are diverse, kind, and community oriented. Surrounded mostly by water and only minutes from the Gulf of Mexico, there are always outdoor activities to entertain the family and friends. Commute times from Navarre to Eglin AFB is around an hour and to Hurlburt Field is about 20-30 minutes. As population has increased there has been an increase in traffic, especially since there is only 1 highway I98. Crestview has a small town ‘more country’ vibe. This area is very woodsy with shorter area of beaches than other areas. This area is very affordable because it’s not as touristy as the other areas by Eglin AFB and Hurlburt and the area is more spread out so you can get more land for your money with a bigger house. It has a real family feel and there are a lot of military families and retirees in the area. Crestview is very family friendly with good schools, parks and playgrounds providing a lot of outdoor activities. Downtown Crestview is very quaint with dining and shopping options, along with your typical big box chains nearby. If you are looking for more upscale shopping you would need to go to Destin or Ft Walton Beach area, which is about 30 minutes away. Commute times from Crestview to Duke Airfield is about 20 minutes, to Eglin AFB is about 30-45 minutes depending on traffic, and to Hurlburt Field is about an hour. Niceville is a sister city of Valparaiso and conveniently located very close to Destin. This area is very family friendly with low crime with military families scattered throughout the community. The more affluent areas are to the east closer to Destin, like Bluewater Bay (BWB). The area has highly-rated schools, a small-town vibe, and gorgeous views. Since Niceville is surrounded by water, there is a lot of outdoor activities (parks, rec centers etc. ), especially water activities with great fishing, boating, etc. This area has a strong sense of pride and the community supports the school activities and sports. With quick access to Destin, you can find upscale shopping and other amenities, but not deal with the hustle and bustle of tourist life. Commute times from Niceville to Eglin AFB is about 10 minutes (from Bluewater Bay to Eglin is about 15-20 minutes), to Hurlburt Field is about 30 minutes, and to Duke Field is about 25 minutes. Valparaiso (or known as Val-P) is located just outside the east gate of Eglin AFB. There are tons of military families in this area due to its proximity to Eglin Base and affordable homes. Valparaiso has a diverse population because it’s so close to Eglin AFB. There are many military families who move in and out, but they also have many people that have lived there for years. This area is more laid back and not the tourist frenzy of nearby Fort Walton Beach and Destin areas, however it’s close enough to visit on the weekends. Base traffic can be an issue since the community touches Eglin AFB so be prepared for jet noise. Planes are constantly taking off and landing over Valparaiso. Commute times from Valparaiso to Eglin AFB is about 10-20 minutes depending on base traffic, to Hurlburt Field is about 30 minutes, and to Duke Field is about 20 minutes. Shalimar is a nice small town adjacent to Fort Walton Beach with beautiful homes along the waterside. There are a lot of docks with easy access to the water allowing for a lot of outdoor activities and water activities in this area. Most residents go over the bridge to Fort Walton Beach for most shopping and dining options. Since it’s close to Eglin and Hurlburt there are lots of military families in the area, as well. Commute times from Shalimar to Elgin AFB is about 5-10 minutes, to Hurlburt Field is about 20 minutes, and to Duke Field is about 20 minutes. Fort Walton Beach (FWB) is a typical resort community right on the gulf coast with a military feel. Surrounded by two military bases, this area has a ton of military families. This town is all about the water and outdoor activities. It’s definitely a place for active individuals and families. Depending on where in Fort Walton you live, the beach is only 5-10 minutes away. Fort Walton Beach has everything from a thriving downtown with restaurants, shops, farmers markets etc to a fantastic Uptown shopping area with upscale brand names surrounded by great restaurants. Fort Walton is geographically not large so it can get congested with traffic. Also, during tourist season, Destin is packed which means I-98 is very busy with bumper to bumper traffic. Commute times from Fort Walton Beach to Eglin AFB is about 20 minutes, to Hurlburt Field is about 20 minutes, and to Duke Field is about 30 minutes. Destin is located on Florida's Emerald Coast and known for its white beaches and emerald green waters (hence the name Emerald Coast). Destin is a popular tourist destination. Being close to Eglin AFB and Hurlburt Field, Destin is a fun weekend destination for military families. If you are looking to live in Destin, keep in mind that housing prices are high due to the area’s popular demand. Most military families choose other surrounding areas to call home, but Destin can be a fun place for single service members or married families without kids. Destin has it all from a variety of restaurants to choose from, deep sea fishing, parasailing, sailing, boating or just strolling down the pier. During the summer months, the area is swarmed with tourists and beach goers, especially ‘spring breakers’. It’s definitely a faster pace of life with a vibrant night life and a slower, almost dead, winter months. Commute times from Destin to Eglin AFB is about 25 minutes, to Hurlburt Field is about 25 minutes, and to Duke Field is about 45 minutes. Mary Esther is a great place to live near Hurlburt Field and Eglin AFB. It has a small town feel, while still being close to some of the most beautiful beaches in Florida. There are a lot of military in this area and it’s very family friendly. The town has a mall and other big box stores, along with lots of restaurants and local activities. Traffic increases during the tourist season for the area. Commute times from Mary Esther to Eglin AFB is about 15-20 minutes, to Hurlburt Field is about 5 minutes, and to Duke Field is about 30 minutes. Millcreek Farms in Baker are just a few of the most recommended neighborhoods near Eglin AFB and Hurlburt Field. ->Click to read about the popular neighborhoods near Eglin AFB. Eglin AFB base housing is Warrior Landing, Poquito Bayou, and Hidden Oaks. Hurlburt base housing is Soundside, Opsrey Landing and Live Oak. Click here to read Off Base Neighborhood reviews, Military Housing, Apartments, Realtors, Homes, Things to Do, and Local Businesses. Whether you are looking to buy or rent a home near Eglin AFB, search our large database of Military Friendly Realtors near Eglin AFB. Real estate agents can help you narrow down your search and keep you in the loop when houses come on and off the market. Search MilitaryByOwner's rental homes or military homes for sale near Eglin.